Sequoia and Kings Canyon National Parks are located in west central California, west of Death Valley National Park and east of Fresno, California. 1. Take I-5 South to Stateroad 180 West to the park. 2. Take Stateroad 99 South to Stateroad 180 West to the park. 1. There is no access to the park from the east. 1. Take I-5 North to Stateroad 198 East to the park. 2. Take Stateroad 99 North to Stateroad 198 East to the park. 1. Take I-5 North or South to Stateroad 180 East or Stateroad 198 East to the park. 2. Take Stateroad 99 North or South to Stateroad 180 East or Stateroad 198 East to the park. Sequoia is the second-oldest national park in the United States. It was established on 25 Sep 1890 to protect the Big Trees in Giant Forest, including the General Sherman Tree, the world’s largest living thing. Sequoia also contains the Mineral King Valley and Mt. Whitney, the highest mountain in the U.S. outside of Alaska. A small portion of what is now Kings Canyon was originally set aside in 1890 as General Grant National Park. In 1940, General Grant was absorbed into the new and larger Kings Canyon National Park which eventually grew to include the South Fork of the Kings River and 456,552 acres of backcountry wilderness. Managed as one park, together Sequoia and Kings Canyon total over 863,700 acres. People first started coming to the sequoia forests in large numbers shortly after the end of the Civil War. The General Grant Tree was discovered in 1862 by Joseph Hardin Thomas and named in 1867 by Lucretia Baker. Five years later, on 01 March 1872, Ulysses Grant, now president of the United States, signed the bill designating Yellowstone as the world’s first national park. The area around the Grant Grove of giant sequoias was set aside in 1890 as General Grant National Park. (Yosemite National Park was created in the same piece of legislation.) 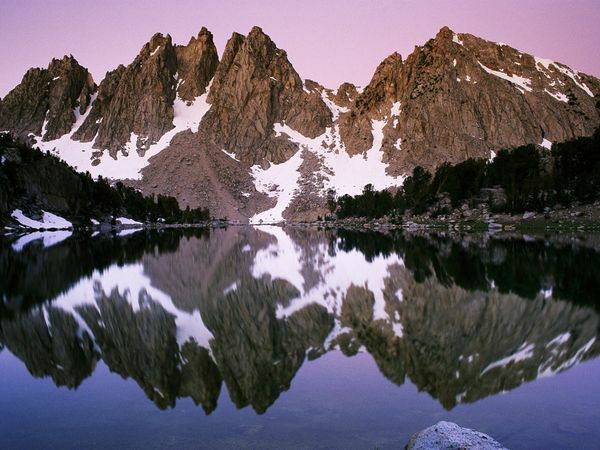 In 1940, General Grant was included in the newly created Kings Canyon National Park. Visitation is heaviest in the summer, with August being the busiest month. Visitation is lightest in the winter. Mule deer are the prime prey sought by elusive mountain lions. Pine martens, fishers, and wolverines pursue squirrels and other smaller animals. Black bears may take fawns or eat carrion but subsists mostly on vegetation. Marmots and pikas inhabit the mountains. Coyotes, gray fox, bobcats, raccoons, and ringtails patrol the foothills. Decades of fish plantings introduced non- native brown, brook, golden, and cutthroat trout, but rainbow trout and little Kern golden trout, native to the Sierra’s west slope streams, are being restored. Crystal Cave was discovered in 1918 by two park trail construction employees who were fishing along Cascade Creek on their day off. Walter Fry, a former Park Superintendent and caving enthusiast, led the first exploration party into the cave on April 30, 1918. Sequoia and Kings Canyon National Parks contain some 3200 lakes and ponds and approximately 2600 miles of rivers and streams. Three major rivers originate in these parks –Kings, Kaweah and Kern. These rivers provide valuable irrigation water to the rich agricultural lands in Fresno, Kern and Tulare counties as well as providing water for recreation and industrial activities outside the parks. The monitoring and maintenance of watershed health is clearly of interest not only to park managers but also to water users thoughout this region. The Foothills, Lodgepole, and Grant Grove visitor centers and their restrooms are wheel-chair accessible. Although they do not meet ADA standards, the trails to the General Sherman and General Grant trees are paved, as is the Congress Trail and the Trail for All People (both in Giant Forest). The Ash Mountain, Hospital Rock, and Big Stump picnic areas have modified picnic tables. In the winter, accessibility in the Grant Grove and Giant Forest areas may be limited due to deep snow. There are many opportunities for backcountry camping and hiking. I recommend that you plan your trip and the areas you would like to see and then go and relax and make a day of it. Go and see all that is in the area and enjoy it. You spend more quality time and learn and see more than you could ever imagine. Driving time from Ash Mountain (Highway 198 entrance) to Grant Grove (Highway 180 entrance) is at least 2 hours, not counting stops. Road construction between Ash Mountain and Lodgepole may affect this driving time. A side trip from Grant Grove into the Kings Canyon will take an extra 2-3 hours. First-time visitors should be sure to see the General Sherman and General Grant trees, both easily accessible from the road. Biking is allowed on the main roads in the parks but is prohibited on park trails. Campgrounds in Sequoia and Kings Canyon are operated by the National Park Service. In Sequoia, South Fork and the Mineral King campgrounds have pit toilets. All other campgrounds provide flush toilets. All areas except South Fork have drinking water and sanitary disposal stations. There are no hook-ups for RV’s in any of the park campgrounds. Showers are available in summer at Lodgepole, Grant Grove, and Cedar Grove through the concessioner. Additional campgrounds are located in the national forests adjacent to the parks. The Golden Access Pass is a free pass available to all permanent U.S. residents who are eligible to receive federal benefits based on disability, whether or not you are actually receiving them or not. This pass entitles the bearer, and immediate family or accompanying passengers in a private vehicle, to free admission to all U.S. National Parks, Monuments, Forests, and Historic Sites, as well as half price camping. Apply in person at any National Park Service or U.S. Forest Service area. Fishing is permitted in most parts of Sequoia and Kings Canyon National Parks, and on adjacent national forests. Persons 16 years of age or older are required to have a California fishing license. Licenses and tackle are available at Lodgepole, Stony Creek, Grant Grove, and Cedar Grove. In the summer, meals, groceries, camping gear, fishing tackle/licenses, and ice are sold at Giant Forest, Lodgepole, Stony Creek (Sequoia National Forest), Grant Grove, and Cedar Grove. Gasoline is not available at Lodgepole and Grant Grove, but is at Hume Lake and Kings Canyon Lodge along Highway 180 in Sequoia National Forest. Diesel fuel is also available Hume Lake. In the winter, light meals, ski and snowplay equipment, and souvenirs are available at Wolverton. Groceries, meals and a gift shop are available in Grant Grove. Together, Sequoia and Kings Canyon National Parks contain 140 miles of roads and 800 miles of trails. Stock, horses, burros and llamas are allowed in the park. Lodging in both Sequoia and Kings Canyon National Parks is available through Kings Canyon Park Services, PO Box 909, Kings Canyon NP, CA 93633 Grant Grove Lodge in Kings Canyon is open all year. Giant Forest and Cedar Grove lodges are open during the summer. Backcountry permits, which are free, are required for all camping outside designated campgrounds. Permits can be reserved up to three weeks before the start of your trip for $10.00 per permit. Most campgrounds in Sequoia and Kings Canyon are first come-first served. Lodgepole Campground in Sequoia is on a reservation system from Memorial Day weekend through mid-October. Group campsites at Grant Grove, Cedar Grove (Kings Canyon) and Dorst (Sequoia) are available by mail-in reservation only. Please be aware that pets are not allowed on any trails in Sequoia and Kings Canyon National Parks. In developed areas, pets must be kept on a leash at all times. Viewing the giant sequoias; hiking; backpacking; horseback riding; fishing; cross-country skiing and snowshoe walks; ranger walks, talks and campfire programs are some of the programs and activities in the parks. Cedar Grove Visitor Center, Grant Grove Visitor Centers, Foot Hills Visitor Center, Lodgepole Visitor Center, Mineral King Visitor Center are the five visitor centers in Sequoia and Kings Canyon National Parks. Deep snow often covers the middle elevations from December to May, but sub-zero temperatures are rare. Precipitation falls mostly between January and mid-May, but thunderstorms, rain and even snow can occur at any time of year. Temperatures vary with elevation. In the summer, daytime temperatures often exceed 100° F in the foothills, but seldom exceed 90° F in the sequoia groves. Even in the summer, backpackers in the highcountry can encounter nighttime temperatures in the low 30’s, and occasionally even in the 20’s.